Decadence without breaking the budget! 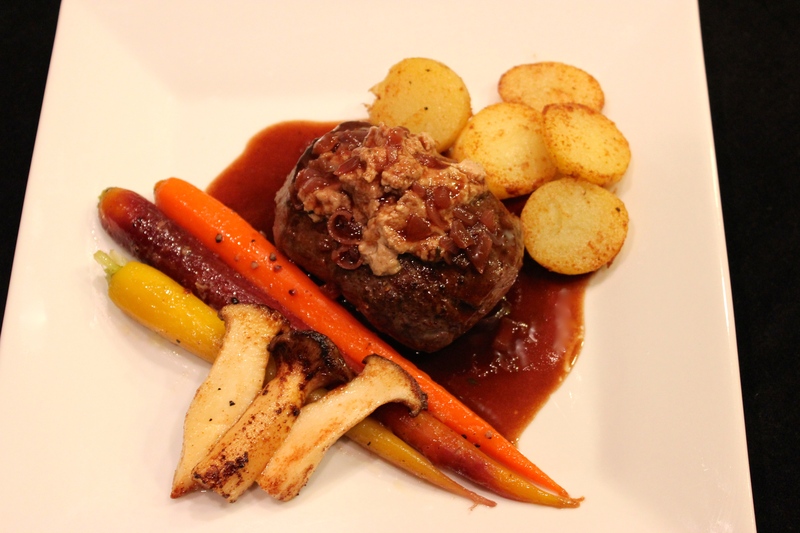 These venison loin medallions are topped with a black truffle foie gras pate and served with potatoes, glazed carrots and trumpet mushrooms. It’s so incredibly easy and your guests will think you’ve slaved for hours in the kitchen but it only took minutes to transform the venison medallions into a dish worthy of a four star restaurant. Black truffles and foie gras are some of the most expensive ingredients on earth, but you can have an amazing dish at a fraction of the cost with black truffle foie gras pate from D’Artagnan foods. I added some extra pate into the red wine sauce to take this dish over the top!! 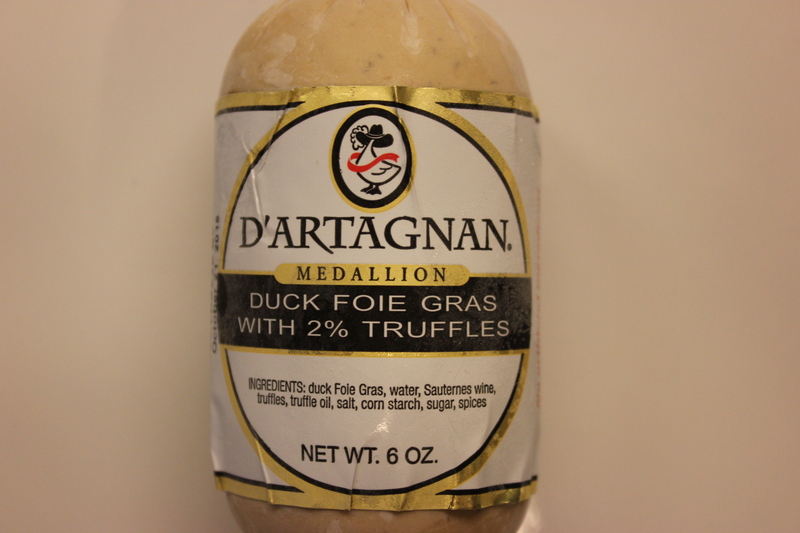 I purchased this package of black truffle foie gras pate from D’Artagnan Foods online. It was about $15 for a 6 ounce package. I used it to top the venison medallions, once they were almost cooked through. 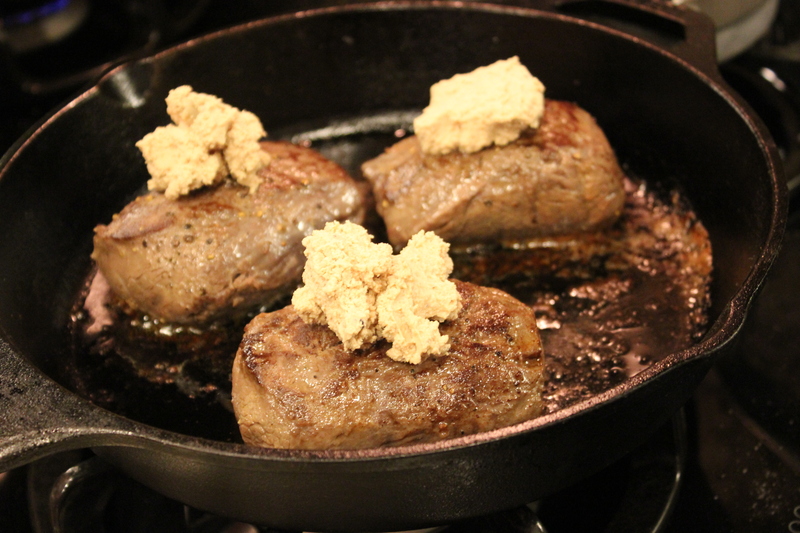 Start by seasoning with kosher salt, the boneless loin medallions 24 hours ahead. Salting for 24 hours will always give a more flavorful result in cooking. I never skip this step. The next day, I brought the medallions to room temperature, by pulling them out of the fridge and placing them on the counter for 1 hour before searing. Then I preheat the oven to 350º. I added some oil and heated the pan over medium-high heat. 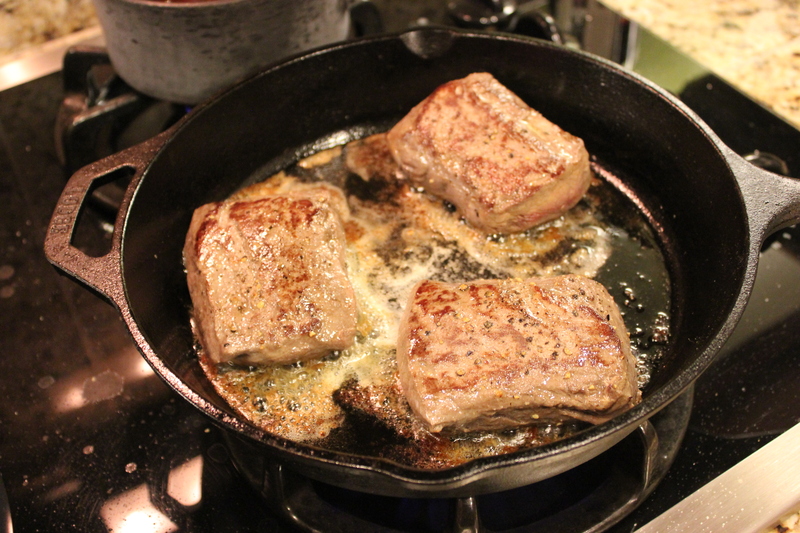 Sear the medallions until brown then turn over and sear the other side. Then I placed them in the oven for 6 minutes to roast. Once the medallions have finished I served them with a quick red wine sauce which I whisked in the remaining pate to take this dish to A-MAY-ZING!!! Decadence without breaking the budget! 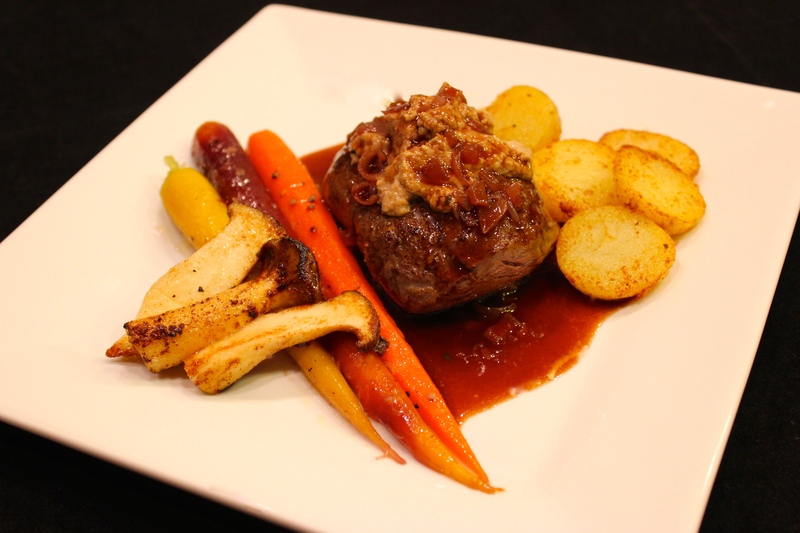 These venison loin medallions are topped with a black truffle foie gras pate and served with potatoes, glazed carrots and trumpet mushrooms. It's so incredibly easy and your guests will think you've slaved for hours in the kitchen but it only took minutes to transform the venison medallions into a dish worthy of a four star restaurant. Black truffles and foie gras are some of the most expensive ingredients on earth, but you can have an amazing dish at a fraction of the cost with black truffle foie gras pate from D'Artagnan foods. I added some extra pate into the red wine sauce to go over the top!! 3 Tbs. Butter, divided into 1 Tbs. and 2 Tbs. Season venison loin medallions with kosher salt and refrigerate, overnight. One hour before cooking, bring the medallions to room temperature on the counter. Re-season the venison with a bit more kosher salt and fresh ground pepper. Set aside while the sauce is prepared. Over medium heat, to a small sauce pot, add the 1 tablespoon butter, and add the minced shallot and sauté for 2 minutes. Add the wine and heat for 4 minutes. Then add the stock and continue to reduce for another 4 minutes. Mix the remaining 2 tablespoons butter, and flour together to make a paste, and whisk into the sauce to thicken. Once the sauce is thickened, turn down the heat to keep warm until the dish is finished. Heat an oven safe pan (or cast iron), over medium high heat. Add a few tablespoons oil. Add venison medallions and sear until browned. Turn over and sear the other side until browned, then place in the oven for about 6 minutes. Remove the medallions from the oven and top each with 2 tablespoons (about 1 ounce) black truffle foie gras pate (*reserve the remaining pate for the sauce). Turn off the oven and place the venison back in the oven to heat the pate. Just before serving, whisk in any leftover pate to the red wine sauce. I served this dish with yukon gold potatoes that were first boiled whole and unpeeled until tender, shocked in cold water, drained, then sliced and sautéed in butter, garlic powder, onion powder, salt and pepper. 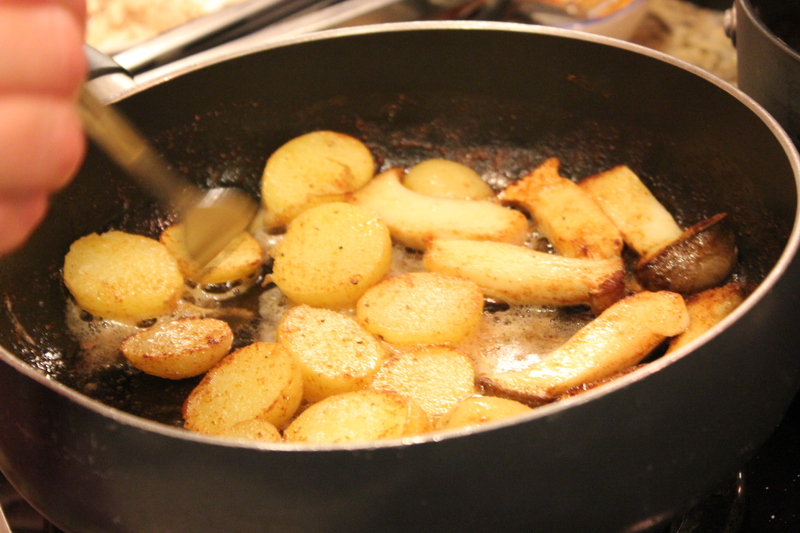 The trumpet mushrooms were sliced and sautéed along with the potatoes. 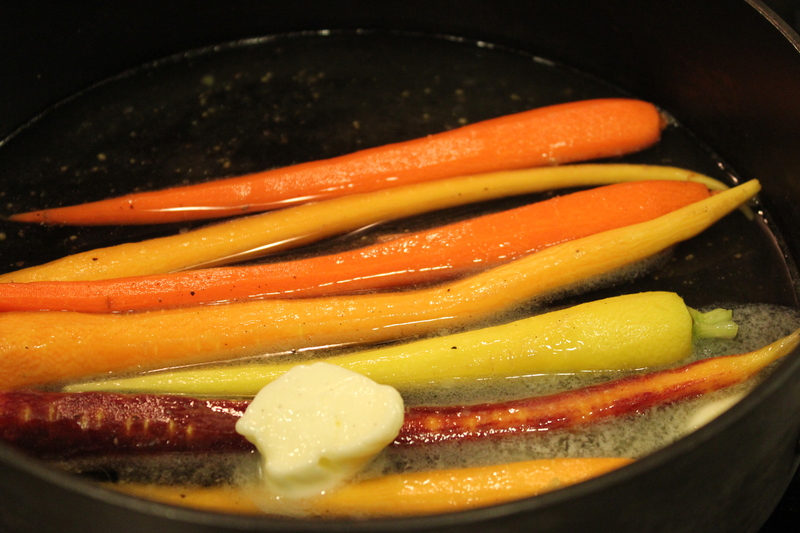 The carrots were braised in a frying pan with 3/4 cup water, a tablespoon sugar, 2 tablespoons butter, salt and pepper. They were cooked at a medium simmer for 20 minutes, until all the water was evaporated, and turned into a caramelized glaze. The potatoes can be boiled the day ahead and refrigerated overnight, then sliced and sautéed just before serving, as well as the mushrooms. The carrots can be started 20 minutes ahead of serving time to simmer while the venison is cooked.